There is a rowing term in the book “The Boys in The Boat,” the 2013 Daniel James Brown best-seller about the Depression-era University of Washington crew team, that stuck with Robin Ellwood ’85, ’93G, ’13G: swing. It referred to moments on the water when the rowers, a rag-tag group of underdogs who won a national championship and a gold medal at the 1936 Olympics in Nazi Germany, worked in near-perfect synchronization, propelling their boat faster and more smoothly than they had imagined possible. “I was inspired by the idea of ‘finding your swing,’” says Ellwood, who earned her undergraduate degree in zoology and both a master’s degree and a doctorate in education and heads up the STEAM (science, technology, engineering, arts and mathematics) program at Rye Junior High in Rye, New Hampshire. So inspired, in fact, that she and other staff members created a project-based learning unit to explore how individuals and groups find their swing “in life, in performance, in everything,” she says. For Ellwood’s students, that meant building their own boats. That buy-in came with “Finding Your Swing.” Throughout the 2017–18 school year, the theme was used across the curriculum in math, science, art, music and social studies for a number of student challenges. Additionally, the entire school read a young-adult-readers version of “The Boys in the Boat,” and each grade level spent a trimester — 14 to 16 weeks — building a pair of rowboats by hand. While the supplies came in the form of a kit, Ellwood says the boats were “built from the bottom up, literally.” There were three different models, which got bigger with each grade: sixth graders built 8-foot boats, seventh graders, 10-foot boats, and eighth graders built 17-foot boats. The oars were all made from scratch. The year-long project was documented on Ellwood’s website, Finding Your Swing, where students can be seen in the school’s basement workshop using drills and routers, applying fiberglass, epoxy, paint and varnish, and creating the oars from cypress boards. Members of the UNH crew team visited the school and talked with students about their rowing experiences, sharing video clips, stories and their thoughts about how their participation in the sport helped them find their swing on multiple levels. Rye resident Dan Brown, author of “The Da Vinci Code” (and no relation to Daniel James Brown), also spoke with students about how he found his swing. Then came the test. During the culmination of the year-long “Finding Your Swing” project in May, Ellwood and her colleagues put on an event they dubbed the 2018 Rye Rowing Regatta at Rye Harbor. And while the day included three grade-specific boat races, Ellwood says the emphasis wasn’t on winning or losing. SYDNEY MICHALAK ’18 has a “how I spent my summer vacation” story that’s hard to top: Not long after commencement, the mechanical engineering major and four-year UNH crew team member competed in her first-ever world rowing championship. With Team USA. In Poland. 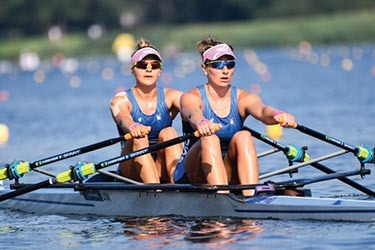 Michalak and her rowing partner Ashley Johnson traveled to Poznan for the World Rowing Under-23 Championships in July. June 21, 2017 | Misc.